Landing big fish need not cost big bucks. And unlike some other braided lines, Sufix 832 Advanced Superline® prevents break-offs at a price that won’t break the bank. It’s available on the shelves of all your favorite sporting goods retail stores now at an even better price. 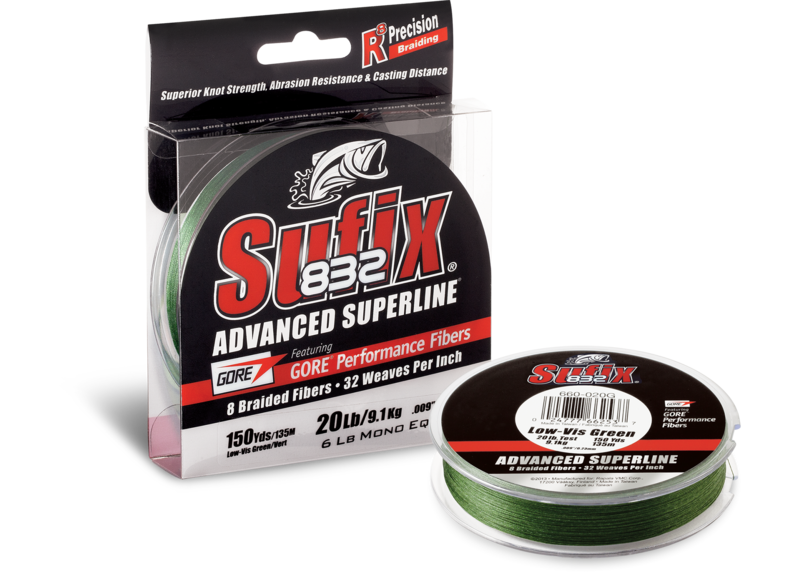 That’s great news for anglers across the country, as Sufix 832 is the braid of choice for putting fish of all species and sizes in the boat, in all sorts of situations and conditions – not just for pitching and flipping into heavy cover for largemouth bass. When spring walleyes are occupying flats in 4 to 10 feet of clear water, Freshwater Fishing Hall of Fame Legendary Communicator James Lindner targets them with minnows or soft-plastics thrown on 10-pound-test Sufix 832 tipped with a three- to four-foot leader of 10-pound-test Sufix Castable Invisiline™ 100% Fluorocarbon. The diameter of 10-pound Sufix 832 braid is equivalent to that of 4-pound-test monofilament line. Whether you’re casting or dragging jigs, Lindner says, a “variety of key attributes” makes a Sufix 832 main line key to putting fish in the boat — increased sensitivity to feel light bites, the ability to make long casts, and easy hook-sets. Sufix 832 does not stretch, so when you set the hook, a fish is pegged almost immediately. Monofilament and fluorocarbon line will create a slight delay – more so with the mono – because they stretch. “If I’ve got 45 feet of mono out on the end of a cast and I start to pull up on the bait, you have to take some of that stretch out of it,” Lindner explains. A main line of 10-pound-test Neon Lime Sufix 832 helped Minnesota pro Seth Feider drop-shot is way to victory in the 2016 Bassmaster Angler of the Year tournament on Mille Lacs Lake in his home state. The no-stretch braid ensures his bait is directly below his depthfinder, with which he is targeting individual fish. “I can get right above a fish with the graph and see if the fish is looking at it,” Feider says. Neon Lime is one of two high-visibility colors in which Sufix 832 is offered in order to improve hook-up ratios. The other is Hi-Vis Yellow. Both make it easier to see strikes before you can even feel them. In a runner-up finish in a Bassmaster Elite Series tournament last year on Alabama’s Wheeler Lake, Dave Lefebre spooled up 65-pound-test Sufix® 832 Advanced Superline braid to land the big bass he was catching on a Terminator® Super Stainless Buzzbait. He knew he had the right combination of bait and line when in practice he boated a 7-pound largemouth. Freshwater Fishing Hall of Fame Legendary Guide Tom Neustrom spools up 10-pound-test Sufix 832® when targeting walleyes in current or deeper water with a Rapala® Jigging Rap®. “10-pound braid gives me maximum strength while the small line diameter cuts through the water like a knife,” he explains. In such situations, he tips his Sufix 832 main line with a 10-pound-test Sufix Castable Invisiline 100% Fluorocarbon leader “for more immediate hooksets in deep water.” He joins his two lines with a barrel swivel, which reduces line twist with the Jigging Rap, which spirals as it falls vertically. When targeting spring bass with Shadow Rap® jerkbaits, Neustrom tips a 10-pound-test Sufix 832 main line with a four to five-foot leader of 10-pound-test Sufix Castable Invisiline 100% Fluoro. In that scenario, he joins the two lines with a knot, rather than a swivel. Sufix 832 is available in strengths up to 80-pound test. That’s great news for George Poveromo, host of World of Saltwater Fishing on NBC Sports, who trolls for huge tarpon and snook with Rapala Floating Magnum®s spooled up on 50-pound-test Sufix 832 connected via barrel swivel to an 8-foot leader of 60-pound-test Sufix 100% Fluorocarbon Invisiline. Poveromo relies on a main line of 50-pound Sufix 832 also when he’s casting Floating Magnums to coastal fish in rocks. He adds a Bimini Twist before tying on a barrel swivel and 5- to 6-foot leader of 50-pound-test Sufix 100% Fluorocarbon Invisiline. This entry was posted in Sufix. Bookmark the permalink. I use 50# 832 for Fall Chinook with bobber and eggs. The bobber free floats up to the bobber stop to get to the correct depth of the fish. The leader is 20# Invisiline which works well in low clear Fall water. Way to go Suffix! Would like to try Suffix 832 but I mostly troll with only metered line so I can gauge line distance behind the boat. Does this line come metered? A good question! No Metered options in the 832 standard. But, our performance braid does come in a metered option. Check it out below!